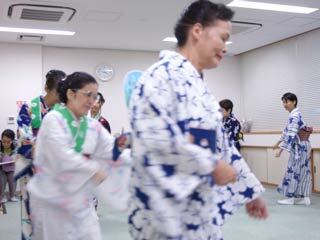 Tankobushi (炭坑節) is the most popular Bon Odori Song. All Bon Odori Matsuri always play this song. So, it is this basic and simple dance which everyone can dance easily. "The song of Coal Miners"
Face your stomach to the walking direction. Count Four when music starts. grab your hands just like you are grabbing a scoop for coal mining. You are getting out from underground. Then you see beautiful moon. watch it two times. Push your lorry. Push your lorry. Then, open gate. Then, back to clap clap and clap.